projectQ: Hackintosh in the mainstream? Since their inception, Hackintoshes have been hobbyists' projects-- while the rewards were great, the work has always been hard, long, and quite frankly, tedious. Even today, hardware compatibility is often simply the result of random good fortune (i.e. power management on Gigabyte's newest motherboards). However, the new Z77MX-QUO-AOS motherboard by QUO Computers may be able to change all of this-- if it actually manages to take off. UPDATE (January 3, 2013): This article by Techspot reviews projectQ and details the Mac OS X installation process. ProjectQ is the codename of the Z77MX-QUO-AOS, a micro-ATX motherboard specifically designed by the startup QUO Computers (and manufactured on special order by Gigabyte) to work with Hackintoshes. The motherboard's self-dubbed "AOS" specification means that it can run "any operating system", including Windows, Linux, and most importantly, Mac OS X. Of course, there are already dozens (if not hundreds) of Hackintosh-compatible motherboards on the market. In recent years, Gigabyte's own motherboards have made especially large leaps and bounds in the field, so that installing Mac OS X on these motherboards has become an almost seamless experience. So where does projectQ fit in? Perhaps the main difference between projectQ and already-existing motherboards is that the Hackintosh compatibility of projectQ is intentional. This fact can't be emphasized enough-- since most motherboards are Hackintosh-compatible simply out of sheer luck, "fully" compatible boards are far and between. Even the most popular Hackintosh motherboards have problems: in one prominent example, the Gigabyte Z77N-WIFI, a motherboard highly recommended by tonymacx86 in his popular CustoMac Mini build, still doesn't have functional built-in Bluetooth and WiFi when running Mac OS X. Meanwhile, projectQ is specifically designed so that every part of the motherboard is Hackintosh-compatible. Like the UEFI of modern Gigabyte motherboards, the UEFI of the Z77MX-QUO-AOS is "unlocked" to work with power management in Mac OS X. This way, you won't need a patched BIOS for it to work properly, unlike in the case of most motherboards on the market right now. In addition, the Z77MX-QUO-AOS features an unusually diverse variety of ports, including USB 2.0 and 3.0, Firewire 400 and 800, Thunderbolt, DVI and HDMI ports for integrated graphics, and Intel LAN, all guaranteed to work with Mac OS X. While most of these ports are nothing new, the guaranteed USB 3.0 and HDMI support will be a welcome relief-- these two features have always been tricky to work with on Hackintoshes. 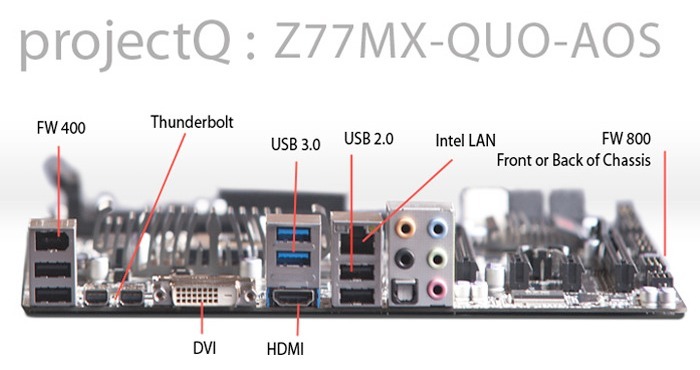 The Z77MX-QUO-AOS will also be one of the only motherboards on the market to still carry compatible Firewire ports (you usually have to buy a Firewire card separately). And of course, the Thunderbolt support is a major addition. Beyond its large number of compatible ports, however, many of the details about the Z77MX-QUO-AOS remain unclear. For the moment, it seems like the Z77MX-QUO-AOS will still require Chameleon or Chimera bootloader to boot Mac OS X, as well as FakeSMC (the very most basic kext for Hackintosh systems). And although this motherboard uses the Realtek ALC 892 audio codec and an Intel ethernet codec, both of which are supported Mac OS X, sound and ethernet probably won't work "out of the box". In all likeliness, you will still have to install extra drivers using tools like Multibeast. So technically, the Z77MX-QUO-AOS may not have complete support for Mac OS X-- installing Mac OS X on a PC will be made easier (in fact, dramatically easier than it is right now), but the process still isn't hands-free. Interested? The Kickstarter page for the Z77MX-QUO-AOS just went up a few days ago, and as of March 5, they've already raised more than $30,000 of their $87,000 baseline goal. Contributing $220 to the project will get you a Z77MX-QUO-AOS motherboard by "May 2013" (though Kickstarter deadlines are notoriously unreliable). Contributing $270 will get you a Z77MX-QUO-AOS with extra WiFi and Bluetooth built-in. It's the question everybody is asking-- sure, the Z77MX-QUO-AOS is nice, but is it worth it? After all, $230-270 is a pretty steep price to pay for a simple motherboard, even one with Thunderbolt and Firewire built in. To answer this question, we'll do a price comparison between the Z77MX-QUO-AOS and its closest Hackintosh counterpart, the Gigabyte GA-Z77X-UP5-TH. Keep in mind, the GA-Z77X-UP5-TH is currently the only Thunderbolt-ready, Hackintosh-compatible motherboard that is widely available in the United States. Cheaper Thunderbolt-ready motherboards like the GA-Z77X-UP4-TH and GA-Z77MX-D3H-TH (which isn't even available in the United States) have audio codecs that are incompatible with Mac OS X, as well as a variety of other problems like incompatible USB 3.0 interfaces, etc. So this one comparison pretty much sums up in the entire market right now. All in all, the Z77MX-QUO-AOS genuinely seems like a pretty good deal. If you buy the motherboard from Kickstarter, it's actually a full $20 cheaper than the GA-Z77X-UP5-TH. The main difference between the two boards is that the Z77MX-QUO-AOS is a Micro-ATX motherboard rather than a full sized ATX motherboard, so it doesn't have quite as many ports as the larger GA-Z77X-UP5-TH. Namely, there's one less PCI slot, one less SATA port, and two fewer USB 3.0 ports, none of which are major omissions. In fact, if you buy the $270 WiFi-ready version of the Z77MX-QUO-AOS, you probably won't even need that extra third PCI slot. The Z77MX-QUO-AOS also includes built-in Firewire 400 and 800 ports, so if you still rely on the Firewire protocol, this motherboard is pretty much your only option. Of course, let the buyer beware. ProjectQ is still in its beta stages; no units have been shipped to the general public yet. And even if the units start shipping at the planned May 2013 release date, it doesn't change the fact that you're doing a business with a startup, which has its own inherent problems. We don't know how QUO Computers will deal with returns for defective products, or customer support, for that matter. Nevertheless, projectQ is one of the most exciting things we've seen in the recent history of the Hackintoshing "scene". In our opinion, the chance for a publicly-available, commercially-viable Hackintosh motherboard is simply too good to pass up; you'll just have to take a risk.